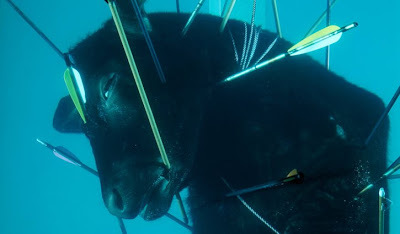 Above: Damien Hirst, Saint Sebastian, Exquisite Pain, 2007 (detail), glass, steel, bullock, arrows, crossbow bolts and formaldehyde solution, 126 3/4 x 61 1/4 x 61 1/4 inches. Courtesy of the Goss-Michael Foundation. Photo by Prudence Cuming Associates. © Damien Hirst. Damien Hirst was born in Bristol, United Kingdom in 1965. He lives and works in London and Devon, UK. He received a BA in Fine Art from Goldsmiths College, London, UK. In 1995, he was the recipient of the prestigious Turner Prize. The list of exhibitions and collections featuring works by Damien Hirst is illustrious. Landmark exhibitions include Young British Artists (1992) at Saatchi Gallery, London; Sensation (1995) at the Royal Academy, London and a solo exhibition at Gagosian Gallery, New York in 2000. In an unprecedented step, Hirst recently offered his work directly atau ction, bypassing the gallery and museum circuit. Sponsored by Scott Miller & Tim Gill, Alan Becker, Ellen Bruss & Mark Falcone, Mary Caulkins & Karl Kister, Nöel & Tom Congdon, Philae & Peter Dominick, Joanne & Ronnie Katz, Carol Keller, Pat Reynolds & Peter Kirsch and Emily Sinclair & Jay Kenney.